These are best planted from late April or early May when we’ll have fresh plants propagated and grown by us as always. Generally, rosemary has a strongly aromatic, dark green, revolute (turned under at the edges) foliage. Leaves are silky on the upper surface and felty and white beneath. All rosemaries flower from April to June and often again from September right through the winter, blurring the distinction between autumn flowering and spring flowering! The flowers have a narrow upper lip and broad lower lip, typically with a well defined white throat and dappled or entirely coloured either side. Most cultivars are hardy to -15C suffering more from wet winters than frost. Indeed the greatest threat to the health of rosemary is waterlogging which often results in die-back, particularly on older woody plants. All the more important to prune regularly straight after flowering in June to encourage new growth which carries flowers the following season. Take growth back by between a third and a half. 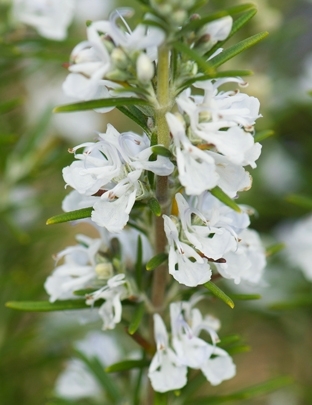 Rosemary thrives in a sunny site and in well-drained soil with a pH of 5 to 8. Use as a culinary herb. In that capacity it’s best to use them in cooked food. This acts to temper the flavour! 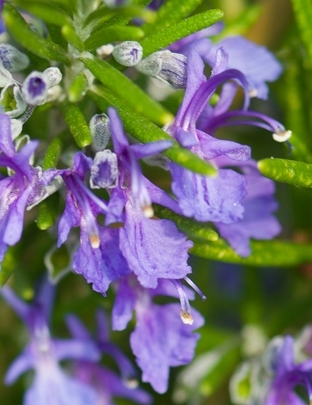 A vigorous upright rosemary with white, blushed-blue flowers. Available now. A striking upright rosemary with beautiful sky-blue flowers. Introduced from Corsica. Available now.